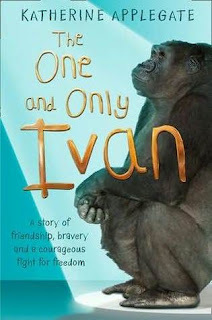 One of the books I recommend every time it is back on the bookshelves is The One and Only Ivan by Katherine Applegate. It picked up the Newbery Medal for the most distinguished contribution to American literature for children in 2013 which I cheered loudly for. Ivan is a gorilla living in a shopping mall converted into a circus/arcade. His friends - a dog and an elephant, and the cleaner's daughter who watches him paint pictures while her dad cleans the mall. It's based on the true story of a gorilla called Ivan who lived in such a place for more than 30 years without ever seeing another gorilla, before being rescued and moved to a zoo where he could live with his own kind. The story is beautifully written with short sentences which makes it a not-too-difficult read but full of emotion and thoughtfulness, so that in spite of the heartbreaking story, we see hope and possibilities if someone will just stand up for what's right.